Saudi Arabia has dropped a bid to join the world's club of French-speaking countries, officials said on Thursday, as the Gulf monarchy faces criticism over the disappearance of a critical Saudi journalist. The International Organisation of the Francophonie (OIF) was set to study the Saudi bid at a summit on Thursday, but the kingdom asked to "postpone" its membership application in a letter, spokesman Bertin Leblanc told the French news agency AFP. Leblanc gave no reason for the postponement or details of the letter. 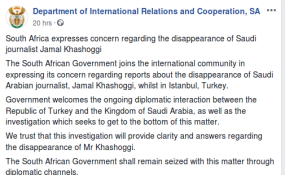 But the announcement came as Saudi Arabia faces growing international pressure to provide a convincing explanation for the disappearance of journalist Jamal Khashoggi after he visited the Saudi consulate in Istanbul last week. Turkish officials have said he was killed but Riyadh denies that. Saudi Arabia's OIF application had faced strong opposition from the group's member states who have criticised Riyadh over human rights violations. Established in 1970, the OIF unites the world's French-speaking countries. It has 58 members and 26 observers which together account for a population of over 900 million people, including 274 million French speakers. The Armenian capital Yerevan is hosting the annual summit of the Francophonie on Thursday and Friday, with French President Emmanuel Macron and Canadian Prime Minister Justin Trudeau both in attendance. French is currently the world's fifth most spoken language after Mandarin Chinese, English, Spanish and Arabic, according to official French estimates.